With the midterm elections just weeks away, the numbers indicate that Republicans are pretty well positioned to take control of the Senate. While this is good news, in that it would give Republicans what they need to pass much-needed legislation to stimulate our economy, strengthen our immigration system, and put the brakes on some of the out-of-control agencies in our federal government. Not that they would have any prayer of getting this type of legislation signed by President Obama, but at the very least, it would give the lie to the “do-nothing” lies that Democrats have used to smear the Republican-controlled Congress. But as usual, the Republican Party seems intent on squandering a great opportunity to secure a future for the party, and for conservatism, within the U.S. government. President Obama, intent on doing anything and everything he can to skew the elections in the Democrats’ favor, has pushed off the announcement of insurance rate increases under Obamacare until after the midterm elections. He has put off his plan to take executive action on amnesty until after the midterm elections (though the federal government has been caught making preparations for amnesty). He has delayed the announcement of his pick for Attorney General until after the midterm elections. He has pretty much delayed his entire agenda until after the midterms, because the only concrete action he can possibly take to improve Democrats’ chances is to do nothing. Recent circumstances have given Republicans a singular opportunity to highlight the dangers of big government…but it is a chance that they are in the process of squandering. Everyone seems to become more conservative during election season, R or D, but after the elections, it will be back to business as usual, no matter who wins. GOP leadership positions are still securely in the hands of the elitist RINOs. At last check, they were leaning heavily toward supporting amnesty, and with President Obama’s upcoming executive action, it looks like we’ll get amnesty whether the voters want it or not. When it gets right down to it, they players at the top are in it for two reasons: money and power. Parties don’t matter. Ideology doesn’t matter. What’s best for America is irrelevant. Republicans are banking on dissatisfaction with President Obama to sweep them into power in November, and again in 2016. The prevailing rumors that Jeb Bush and Mitt Romney could be the GOP’s top contenders in the next presidential election prove that the party has learned nothing from the past two presidential elections. Either one would lose to Hillary Clinton in a landslide, because no one, of either party, really wants to vote for either of them. If the nation’s current dissatisfaction with the Democrats proves anything, it is that dissatisfaction with the other political party doesn’t make a good long-term strategy. Too many Americans are fed up with inside-the-beltway business as usual. The GOP party elites have made it clear that they are more willing to fight true conservatives than they are to fight the socialists in the Democrat Party – and that’s just fine with the Democrats; it makes the general election battles that much easier to fight, because fewer conservatives will vote in the general election. Just take the California governor’s race as an example: the GOP elites campaigned harder to take down true conservative Tim Donnelly in the primary election than they are against Jerry Brown. 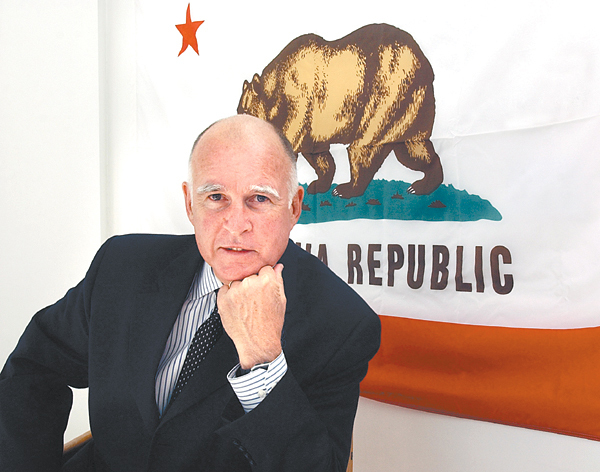 Frankly, I’m more than a little tempted to vote for Brown myself, even though he is a leftist – he’s going to win anyway, and if he wins by a big enough margin, it might actually serve to convince the Republican Party that running milquetoast RINOS every time won’t win elections. We’re reaching a point in America where our nation hangs in the balance. We’ve been on the wrong track for decades, and the current crop of politicians in Washington has stopped trying to make things better, because it’s that much more fun to bicker over which party’s corrupt big-government statist gets to hold the gavel, while they all rake in the special interest cash. By going full-blown socialist, the Democrats have made their choice clear: they want to turn America into the second Soviet Union. Meanwhile, the GOP is living in the 1990s – and not in a good way. Instead of bringing back a strategy that worked, like the Contract for America, when Republicans actually weren’t afraid to stand for something, they would rather be the Democrats of the ’90s. No morals, no scruples, just a bunch of statists masquerading as patriotic Americans.